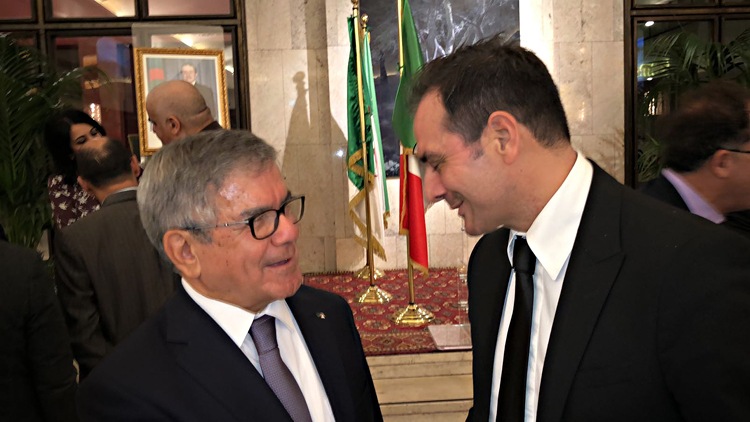 As a representative of Inci-Flex the Director for International Development and CEO of Inci-Flex Algeria Pellegrino Gaeta took part in the official ceremony, conveying CEO Vincenzo Consalvo ‘s regards and thankfulness to His Excellency the ambassador for their courtesy. Numerous political figures, representative of the Armed Forces, the diplomatic corps and members of the Algerian community in Italy were also present. During the ceremony, HE the ambassador Abdelhamid Senouci Bereksi pronounced a speech, underlining the historical value of the event, the existing bond between Algeria and Italy, the depth of the bilateral relationships and the desire of Algeria to encourage and value all efforts to consolidate the relationships among the two Countries. “It was a pleasure and a honor to meet and have a few words with HE the ambassador, a man of great vision who in his speech was able to gather, under the sole flag of respect and brotherhood, both those present and our two beautiful Countries”, Pellegrino Gaeta commented. Time ago Inci-Flex started commercial relations in the North-African country, consolidating relationships with several local companies thanks to an interesting offer based on high quality and continuous professional on-site assistance. By virtue of such experiences, the company is evaluating the opportunity to realize an ambitious project that foresees installation of a productive unit in Algeria, a typology of investment that Algerian authorities promote and support through the simplification of bureaucracy and taxes, in order to prop up occupation and the economic development of the Country.